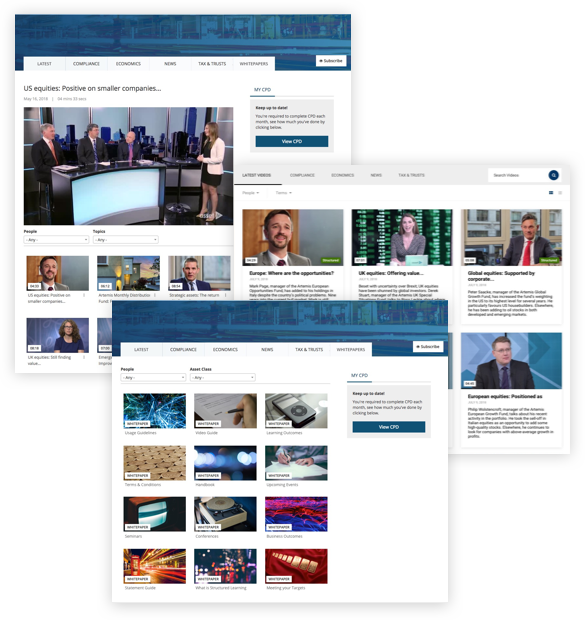 Currently over 20,000 investment professionals use the Asset TV ‘MY CPD’ webpage to manage their CPD. 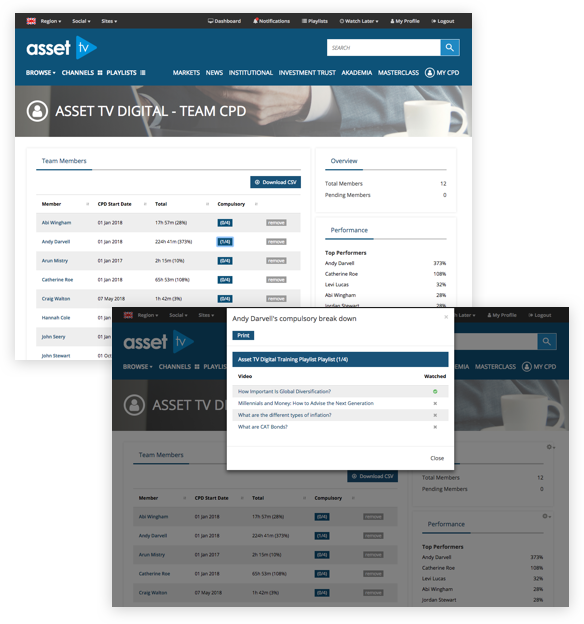 Now managers can monitor their Team’s CPD activity on Asset TV. Maps progression towards individual CPD objectives, as a percentage of target. Shows completion of compulsory videos, as a fraction of the target. Permits an export of data via CSV, for analysis or integration. 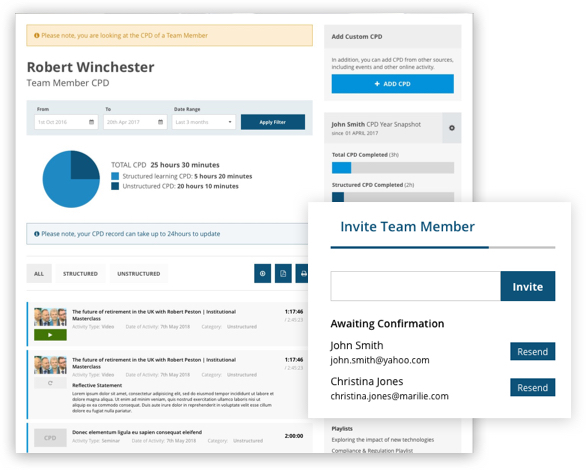 Enables management of individual team member goals. Once registered with Asset TV, a team member can be added by you, using the dashboard invite widget. 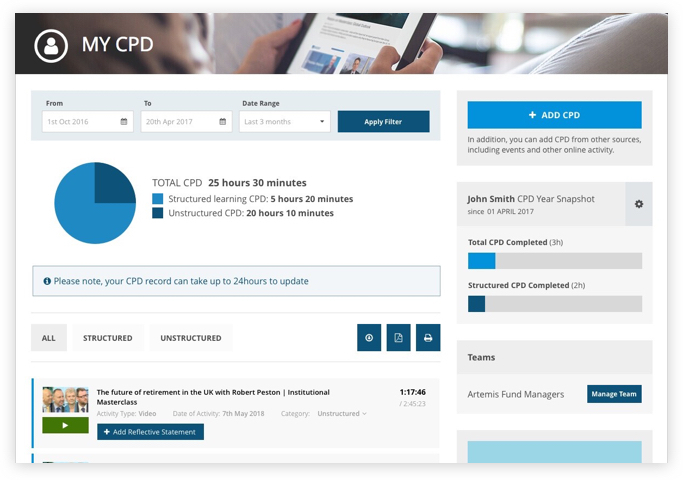 From the dashboard you can to drill down to a particular user and view details of their CPD progression. The Team Manager can set up a compulsory playlist for team members. 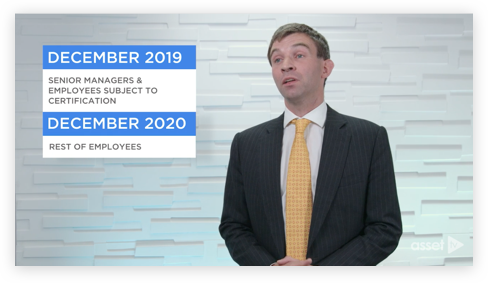 The Team Dashboard will then show the tally of compulsory videos completed by each team member, with the ability to drill into individual member views. 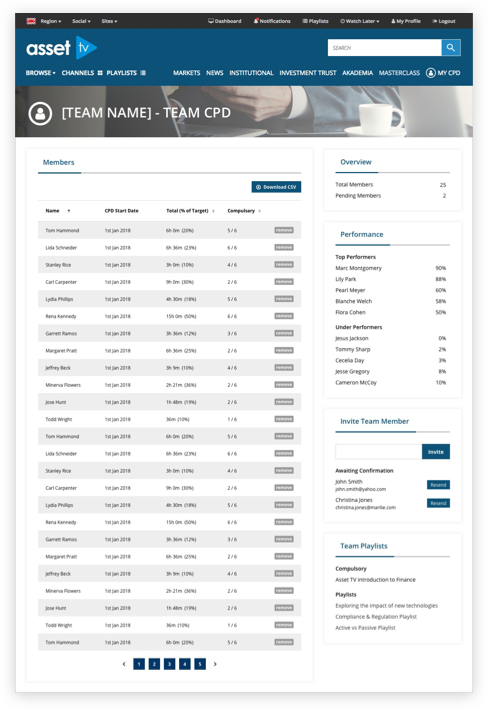 Each team member will see the compulsory playlist in their personal CPD page. Asset TV will continue to film and publish videos specific to supporting SM&CR. Act with due skill, care and diligence. 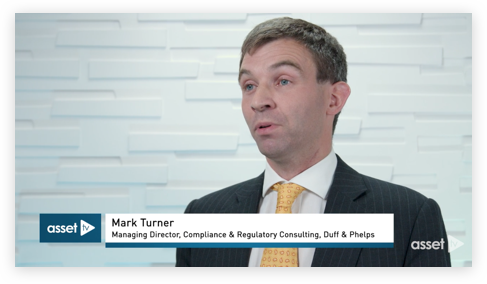 Be open and co-operative with the FCA, the PRA and other regulators. For Senior Management there are 4 more rules that apply. 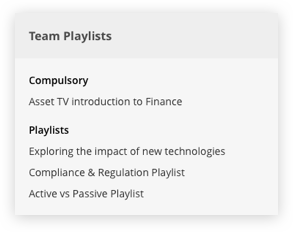 Videos covering these topics will be available on playlists exclusive to Team CPD participants. As an additional service, we can establish a Secure Team Channel, where a company’s bespoke content can be uploaded and managed behind a secure login. This is a private space designed to give your team secure access to content specific to your company’s training obligations and requirements. Secure Team Channels are built with custom tabs to enable you to categorise content for ease of discovery and navigation and set compulsory content for your teams. Secure Team Channeldata is integrated with the ‘Team Dashboard’ to give you an overview of your team activity. Your channel is not exclusively for video. You can create white paper tabs and other custom links to other web resources. If you would like to find out more, have any questions or would like to get started with Team CPD then please get in touch below.